← The Great Oatmeal Challenge – Complete! I’m getting ready for my Caribbean vacation this week. I leave on Thursday – woo hoo! Anyway, I’m attempting some money-saving and healthy eating this week, so I can afford to eat in St. John AND look good while doing it. I found this recipe in an old Food and Wine that I’d forgotten to throw away. I decided to go through the magazine one more time before getting rid of it, and this little gem emerged. Not only did it look easy and healthy, but I owned most of the required ingredients. Double score! I made this soup yesterday, and it will be starring in my lunches this week. It’s a soup triple threat–healthy, easy, and delicious. Here’s the recipe. One bunch of red swiss chard cut into bite size pieces (the original recipe calls for a 5-ounce bag baby spinach, but I happened to have the chard on hand). 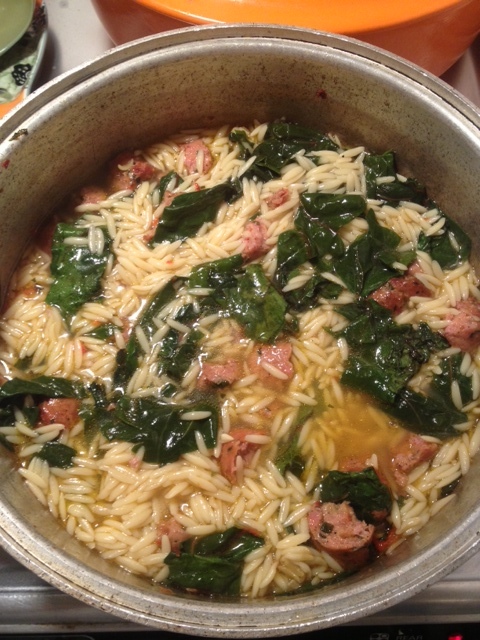 Cook the orzo in salted, boiling water until it’s al dente. Drain and rinse the orzo under cold water until it cools. In a another soup pot, heat the olive oil. Add the chicken meatballs and cook over medium high heat until lightly browned, about 4 minutes. Transfer the meatballs to a plate. Add the chopped garlic to the pot and cook over moderate heat until lightly golden, about 1 minute. Add the broth, bring to a simmer, and season with salt and pepper. Add the meatballs to the broth and simmer until they are cooked through, about 3 minutes. Add the chard and cooled orzo to the simmering broth and cook, stirring, until the chard is wilted and the soup is piping hot, about 1 minute. Ladle the soup into bowls and serve. And, this is what the end result looks like. The recipe makes about 4 servings. Here’s the budget breakdown. Chard, garlic, salt, pepper, most of the chicken broth, and olive oil – all owned, i.e. FREE. Grand total for 4 weekday lunches was $12.36, or $3.09 per lunch.